For over 25 years, Patio Place has been the leading choice among Buena Park residential and commercial customers looking for great prices on brand name patio furniture, fire pits, fire tables, barbecues, umbrellas, gas logs, bar stools, fire glass, and more. We offer Orange County's largest selection of closeout buys from leading manufacturers, such as Ratana, Treasure Garden, Telescope, Sunset West, Galtech, R. H. Peterson Gas Logs, Patio Renaissance, Kings Rattan, Fire Magic, and others. Purchased in bulk at significantly discounted prices, our closeout inventory allows us to offer the highest quality patio furniture and more for the best prices in Orange County. We also deliver cost-effective cleaning and repair services to Buena Park customers. Repairs include replacing or reupholstering cushions; reslinging outdoor furniture; installing replacement parts for bbqs; fixing patio umbrellas by either recovering or restringing it; and more. As a family-owned business, our goal is to create long-standing client relationships. That's why we prioritize customer service at all times. Whether your Buena Park outdoor space is large or small, commercial or residential, we'll take the time to make sure you leave our store feeling confident about your investment. We'll listen to your needs and ask you questions about your decor, property layout, design goals, and budget concerns, and then provide you with honest, expert recommendations. We also offer on-site consulting for Buena Park commercial clients looking to make large purchases, such as country clubs, yacht clubs, and hotels. During these consultations, our sales team will drive to your Buena Park location and provide you with samples so you can compare your potential purchases with your lighting and surrounding decor. 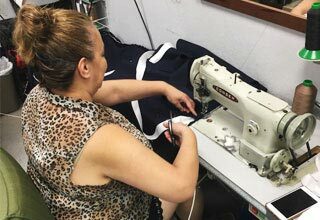 We can also special order custom-made patio furniture; recover existing pieces; silkscreen your business name or logo onto your patio umbrellas, awnings, and banners; and deliver all your purchases within a short timeframe. With a conveniently located showroom near Buena Park, we encourage you to come by and visit us today (click here for contact information). We're open seven days a week and welcome all your questions or special requests. 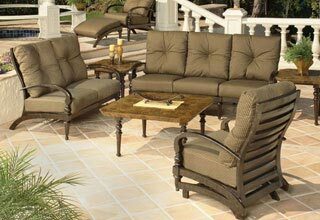 Patio lounge sets, patio chair sets, patio dining sets, bar stools, bistro tables, chaise lounges, cushions, end tables, fire tables, garden tables, loveseats, outdoor sofas, sectionals, gliders, and more, in wicker, aluminium, and cast aluminum styles. Patio umbrellas, cantilever umbrellas, auto-tilt umbrellas, light umbrellas, table umbrellas, and custom-made umbrellas, available in varying sizes (6 ft., 7.5 ft., 9 ft., 11 ft., and 13 ft in diameter). Patio umbrella bases in aluminum, and other decorative styles, and ranging in weight from 50 to 80 lbs. 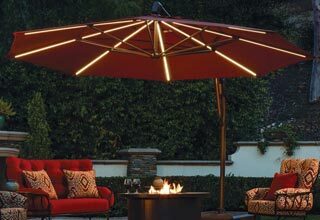 Patio umbrella lights in plug-in, LED, and solar-power designs. BBQs and grills in varying sizes (typically 48" x 22", 36" x 20", 30" x 20", and 24" x 18"). Common barbecue parts, including access doors, warmers, lights, range hoods, and more available upon request. Outdoor cooking equipment, including outdoor fridges, kegerators, drawers, and more. 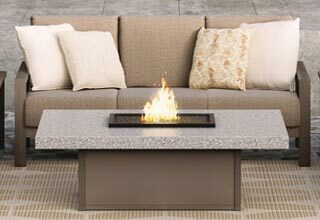 Fire pits and fire tables in varying sizes, heights, shapes, and materials, such as granite, marble, slate, cast aluminum, and more can be ordered as necessary. Ceramic gas logs, river rocks, reflective fire glass, dome covers, and other fire pit or fireplace accessories available upon request. Whatever your outdoor living needs, our knowledgeable staff will help you navigate our inventory and assist you in finding exactly what you're looking for. They will also help you to stay under your budget and find pieces that will beautifully complement the existing decor at your Buena Park home or business. Visit us today. Replacing barbecue island parts, including doors, hoods, grills, lights, and more. Converting barbecues and grills to run on gas or propane. Custom replacing slings, straps, pillows and cushions using Sunbrella, Phifer, and original manufacturer fabrics (over 600 fabrics to choose from). Enhancing patio chairs and chaise lounges with padded replacement slings. Adding zippers to patio furniture cushions for easy removal and cleaning. Restringing and recovering patio umbrellas. For all of the above, we offer an excellent return on your investment as our repairs are competitively priced and long-lasting. Call us today to learn more.